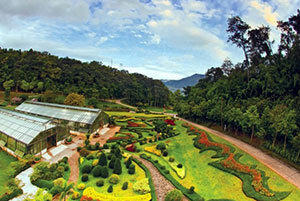 Queen Sirikit Botanic Garden covers a mountainous area of 560 acres. It is located around Km. 12 along the Mae Rim-Samoeng route. This international botanical garden was established to honor Queen Sirikit in 1992. It has a fine collection of Thai and foreign plants. The garden is set up to exhibit plants according to species and climate. Visitors can drive around the area. 1. Rock Garden-Thai Orchid Nursery, takes around 30-60 minutes on foot. 2. Arboreta (plant study trail), showing more than 10 species of plants including banana, palm, fern, and ginger. This trail takes around 45-60 minutes. 3. Climb takes around 1-2 hours to climb the mountain. It is open daily to the public from 8.30 a.m. – 5.00 p.m.